The parts and chapters should be numbered as usual. 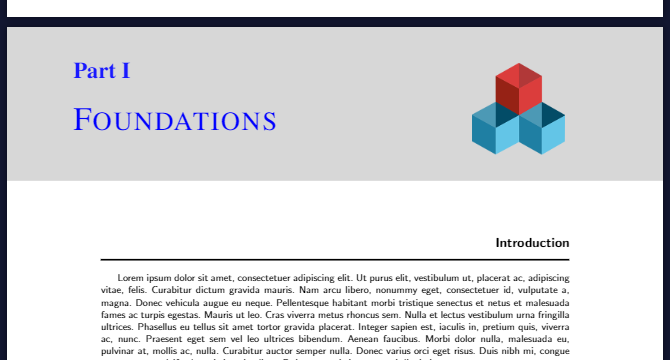 There should be contents referring to the parts/chapter in the Table of Contents, and if I use hyperref package, the ToC contents should be clickable. I have read this question: Problem using a tikzpicture in \titleformat, but that is not what I mean, because the question is about normal TikZ picture in title design, but not about remember picture, overlay TikZ picture in title design. You can either help me to solve my problem, or edit the accepted answer in the attached question so that it suits the requirements well. All your helps will be highly appreciated! How to delete Chapter 0? Here is an attempt. As for instance explained in this answer, by loading the titlesec package with the explicit key, you can make the title part of a tikzpicture, which can of course be an overlay. Not the answer you're looking for? Browse other questions tagged tikz-pgf table-of-contents positioning chapters parts or ask your own question. What is the difference between points, coordinates, and anchors in TikZ/PGF and how can I deal with them? How to fix the position of (0, 0) to (current page.south west) for every tikz picture?